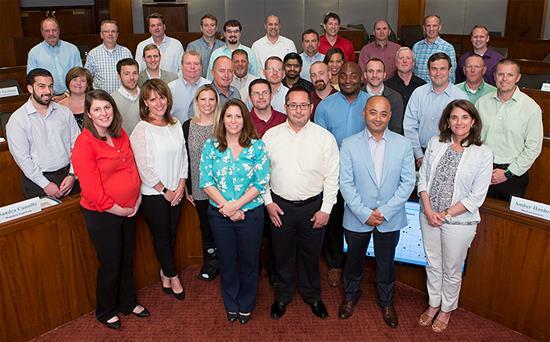 Arlington, VA – The National Grocers Association (NGA) today congratulated 37 grocery executives on their completion of the 2017 Executive Leadership Development Program (ELDP). The event was held June 4 – 8 at Cornell University, located in Ithaca, New York. ELDP helps independent supermarket operators and wholesalers develop leaders from within their organizations who can respond to business challenges in the 21st century marketplace. It is a high-impact learning opportunity for rising grocery executives that provides interactive instruction presented by a mix of respected academic and industry leaders. For the past 14 years, ELDP has been generously supported by PepsiCo. Mark Bowen, Manufacturing Operations Manager, Brookshire Grocery Co.
Nathaniel Brusby, Store Manager, Kennie’s Market’s, Inc.
Sandra Cannillo, Advertising Manager, Wakefern Food Corp.
Layne Chastain, Director of Meat and Seafood, Harps Food Stores, Inc.
Eric Frigiano, Business/Financial Analyst, Wakefern Food Corp.
Joe Greene, District Manager, K-VA-T Food Stores, Inc.
Drew Hembree, Director of Traditional Advertising, K-VA-T Food Stores, Inc.
Dennis Host, Vice President of Marketing, Coborn’s, Inc.
Steve Oroszlany, Category Manager, Wakefern Food Corp.
Mohammad Rahman, Assistant Store Manager, ShopRite Supermarkets, Inc.
Mike Richter, Senior Director of Meat, Seafood, and Fresh, Coborn’s, Inc.
Mike Roberts, Produce Merchandiser, Harps Food Stores, Inc.
Clark Roper, Produce Buyer, Piggly Wiggly Alabama Distribution Co., Inc.
Marty Thompson, Director of Category Development, Coborn’s, Inc.
Peter Torchiano, Store Director, ShopRite Supermarkets, Inc.
Nicholas Arlan, Vice President, Arlan’s Markets, Inc.